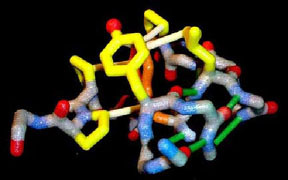 The Trp Cage sticks model, created at the Summer Modeling Institute, shows the backbone and important side chains and hydrogen bonds. Color-coding is non-standard but very appropriate for the physical model. The space-filling Trp Cage model (also produced at the Summer Modeling Institute) shows all the atoms in the structure, including the hydrogen atoms. Since there are only 304 atoms in the structure, this representation translates into a physical model where the role of specific hydrogens in the hydrophobic interactions and hydrogen bonding can be clearly identified and perceived. 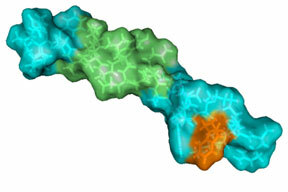 This Trp cage model shows hydrophobic/hydrophilic regions, the tryptophan indol ring is colored in yellow to emphasize its position. Created with Cn3D. 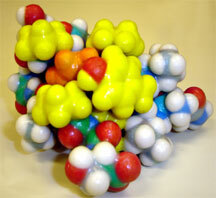 The Center for BioMolecular Modeling (CBM), located at the Milwaukee School of Engineering, uses rapid prototyping technology to produce accurate, three-dimensional physical models of proteins and other biomolecules useful in both the research laboratory and in secondary and post-secondary science classrooms. 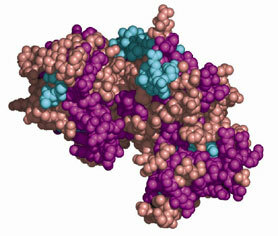 The Trp Cage models were created at the Summer Modeling Institute 2003. Hosted by the CBM, this three-day workshop at the Milwaukee School of Engineering taught participants to create 3D physical models of macromolecules by rapid prototyping. The event was organized and hosted by Tim Herman, Mike Patrick, and Jackie Roberts. For more information on Exendin-4, visit Amylin Pharmaceuticals. 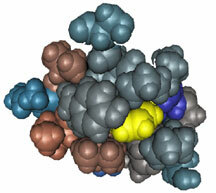 Find m ore information on GLP-1 at Glucagon.com, the Web site devoted to the study of the glucagon-like peptides. For more information on the Methuselah ectodomain, visit the Society for Developmental Biology. The Society for Mathematical Biology provides a forum for discussion of research in biology, mathematical-biology, and mathematics applied to or motivated by biology.